If you have ever bought or sold anything, or tried to assist your clients with anything related to their sales transactions, you have more than likely encountered sales tax. For simple purchases, sales tax is the last line item on a receipt that seems to make everything you buy a bit more expensive. Looking at it on a receipt, sales tax seems simple, but can become complicated very quickly when you are the business owner or an accountant helping a business owner. There are nearly 11,000 taxing jurisdictions and over 60,000 sales tax rules guiding the collection of sales tax in the United States and few resources for small businesses or accountants to turn to in order to ensure proper calculation and compliance. Location: One of the most important factors in calculating a sales tax rate is the location of a sale. For sales that take place over the counter, the address of the business is used to determine the rate. If a business is shipping or sending a product to a location other than their place of business, however, the tax can be based either on the ship from address or the ship to address depending on the sourcing rules of the state(s) involved in the sale. Nexus: Knowing where there is an obligation to collect and remit tax is also relevant because a company may not always need to collect sales tax in every state where they have sales. For sales into states where a business does not have nexus, for example, there is no obligation to collect sales tax on the transaction. In these states, the customer is instead responsible for reporting these sale on their income tax return as use tax. To determine whether your company has nexus in any given state, refer to the rules set out by that state’s Tax Agency or consult with a tax advisor or attorney. Product: The items you choose to sell can change the sales tax rate you have to charge on a transaction. Goods and services are not taxed uniformly across the US. For example, some states exempt or reduce rate certain necessity items such as food, clothing, or medical items from sales tax. In other states, services may be exempt or the states may have a list of items where fees might apply. Eight examples of how the sale tax of a simple lemon can change depending on what the final product being sold is, in Sales Tax of a Lemon. Customer: Who you are selling to can also change the tax rate for a given transaction. Items can go from fully taxable to fully exempt if the customer produces a valid exemption certificate. Each state offers a unique set of entity and use-based exemptions that are available to purchasers. Always remember to collect that exemption certificate. Date: The date of a sales transaction can affect the rate that is applied. Sales tax rates are continually changing, especially at the local level. Not only do states, cities, counties, and districts change sales tax rates periodically, but many states also have sales tax holidays at various times throughout the year. 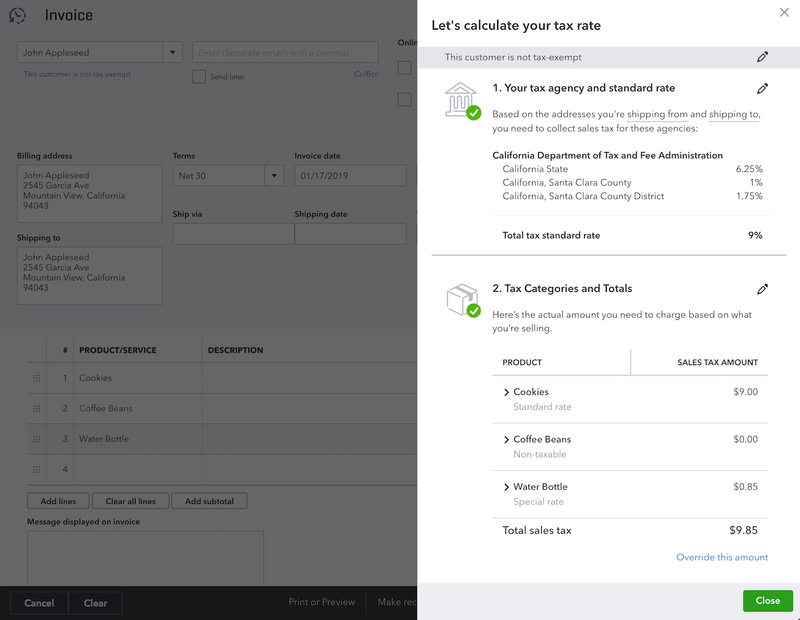 Set up sales tax: Customers can set up sales tax by visiting the taxes tab in QuickBooks. They will need to confirm their business address and record which tax agencies they are registered with. 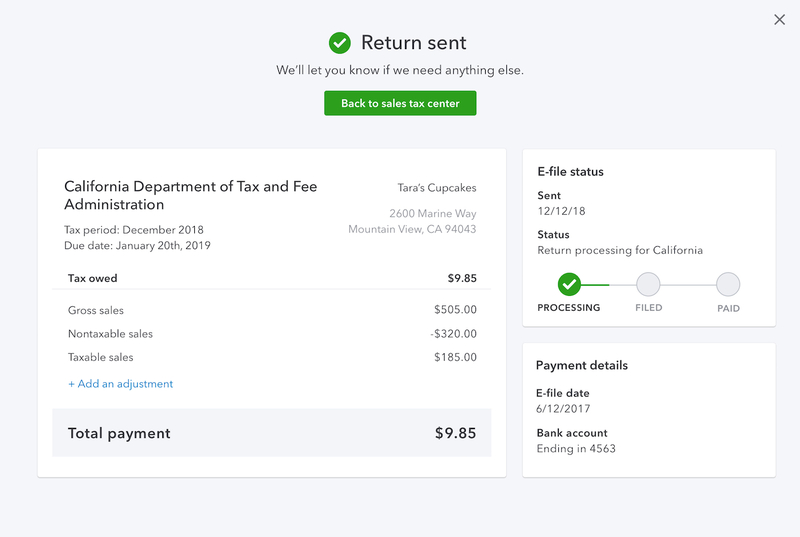 Create an invoice: Customers can include sales tax on an invoice by entering customer information, categorizing their products/services, and marking them as taxable. Unless shipping information is provided, QuickBooks Sales Tax will use the company address for a default rate. 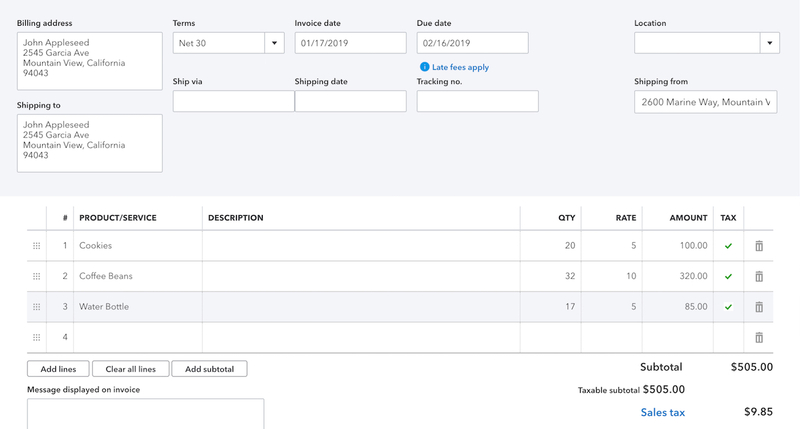 See the sales tax breakdown: Once a customer has included a taxable product on an invoice, they will be able to see how the rate calculation and breakdown by clicking on the sales tax drawer. Customers are also able to make changes from the sales tax drawer. QuickBooks Sales Tax helps customers save time and manage their sales tax obligations by providing the most accurate rules, rates and filing services. This functionality is especially helpful for customers using invoices or sales receipts. There is no more need to track the rates of the 11,000 taxing jurisdictions or 60,000 tax rules because sales tax rates and rules are automatically updated as changes come into effect. For example, many states implemented sales tax rule and rate changes that were effective on Jan. 1, 2019. These changes were communicated to QuickBooks Sales Tax users, but there was nothing more for these users to do than read the communication. 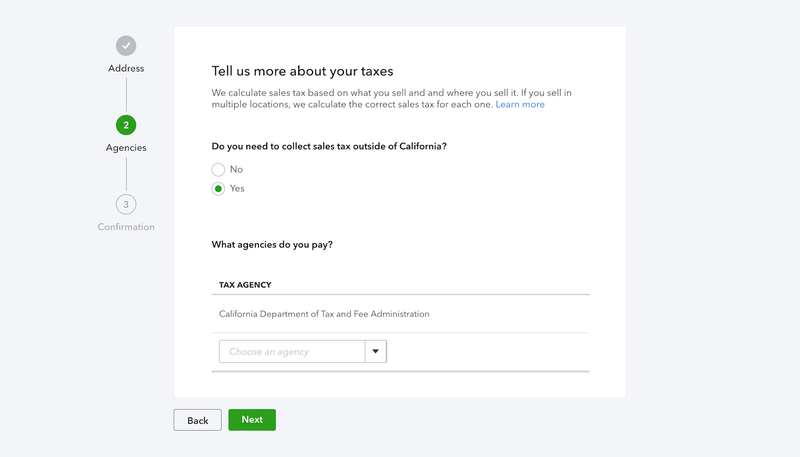 Customers can trust QuickBooks Sales Tax to help them stay current and compliant when it comes to sales tax. You can find more detailed information on how to set up QuickBooks Sales Tax here. Anna-mary Geist is a Tax Manager on the Intuit team responsible for sales tax calculation and filing inside QuickBooks, a part of the Small Business and Self Employed Group. 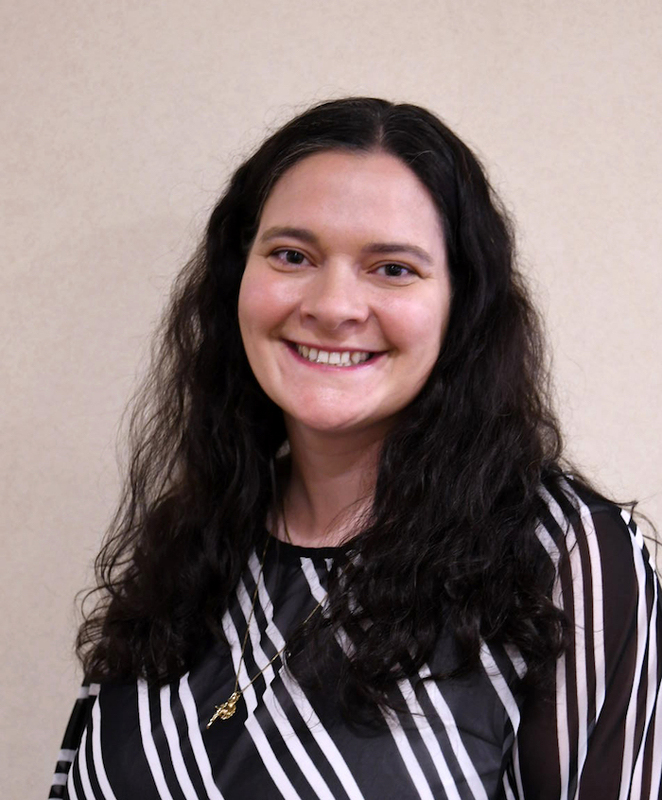 She focuses on providing the tax content that drives sales tax calculations in nearly 12,000 tax jurisdictions across the United States. Anna-mary is also a licensed attorney.